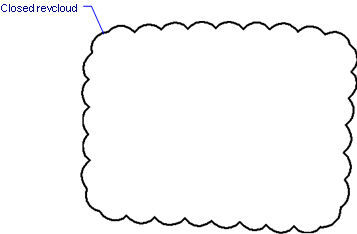 Draws revision clouds commonly used for redlining drawings (short for "revision cloud"). 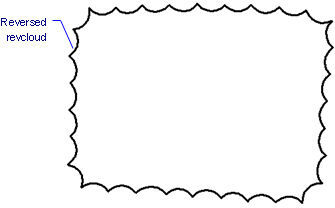 Click a point to start drawing; when the cursor returns to the start point, the revision cloud closes automatically. 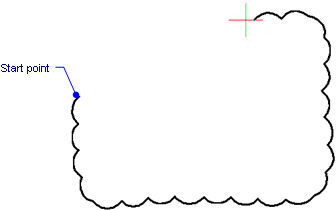 The revision cloud is drawn as a closed polyline composed of arcs. For red revision clouds, set the layer color to red. Specify minimum length of arc - enter a value. Select entity - choose the entity to be converted into a revision cloud. 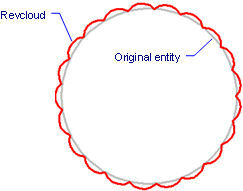 Entities can be open or closed; the original entity is erased. Draws a cloud shape for as long as you keep the mouse button pressed down; when you let go, the program automatically closes the cloud shape. Select the revcloud. Notice that it has many grips. Drag a grip to stretch the cloud. Sketch - draws freehand sketches.